We know we need to eat more vegetables. The challenge is to do it with flavor and variety. So we've become creative. Put all your vegetables in a blender, pulverize and serve. There's a booth at my local farmers market dispensing cups of green slop to devotees of that religion. I've tried it. I haven't converted. Another approach is to chop up whatever you find in your vegetable drawer and put it on lettuce. This is more viable but looks and tastes an awful lot like salad, something that's been around for a while. Or, take a mandoline to your vegetables, toss with olive oil and a dash of salt and serve them hot alongside a sandwich as chips. This vegetables-as-chips innovation has gone viral and can be found in grocery stores, restaurants and food trucks across the country. I've leapt onto this bandwagon with both feet. 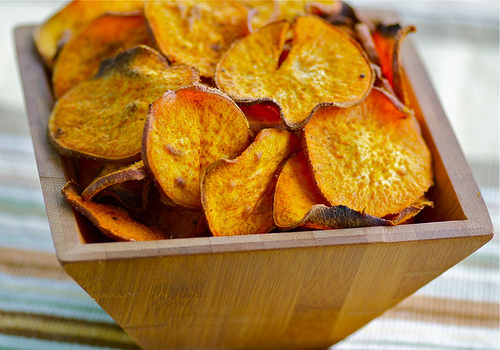 Please click here to continue reading the post at NPR.org and to get recipes for Curried Sweet Potato Chips, Chili-Lime Plantain Chips, Kale Chips, Simple Salted Beet Chips and Smoked Paprika Carrot and Parsnip Chips. 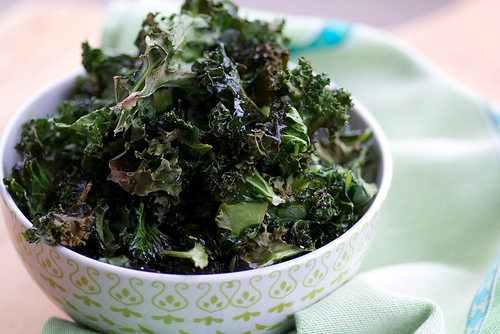 Chips are a great way to convince yourself to eat your veggies especially if they're homemade! I've always wanted to make my own veggie chips! Love this! I am all for veggies as chips. Buying a mandoline has been one of my best investments this year. The next thing I want to try is root chips. Great post! Have been wanting to try kale chips for some time and recently saw a recipe for sweet potato chips somewhere else as well... these are calling my name!